Fans of the the Peach Patterns Pearlie Dress & Peplum Top will know that this pattern is already a really quick sew. Having said that, attaching neck bands is usually the number one cause of heartache associated with sewing patterns for knit or stretch fabrics. At some stage you will definitely want to try and make a neck band for your Pearlie Dress. There are two options (narrow and standard) and, really, they are fun to make. But if you're in a rush or are new to sewing with knits then you might like to give this method a try. Making your neckline in this way creates a slightly different look: less "t-shirty" (if that's a term?) and a little more dressy. All you will need is a twin sewing machine needle for stretch fabrics and two spools of thread in the same colour. Fusible hemming tape is optional but not required (we made ours without using hemming tape). Two spools of thread in the same colour. Extend the neckline area of your Front and Back Bodice pattern pieces by 1/2" (15mm) evenly all the way along (see diagram below). B. Pinning your original pattern pieces to your fabric and using an erasable fabric marker to mark the extended cutting lines on your fabric. It will help to use a tape measure to mark some points at 1/2" (15mm) all the way along the new curves before connecting the points with your marker. Insert your twin needle into your sewing machine, thread it and sew around the neckline 3/8" (1cm) from the folded edge. Sew carefully making sure you catch the raw edge on the wrong side of the fabric with your bobbin thread. (If you are new to sewing with twin needles you may want to have a practice on a piece of folded fabric first to ensure that you are using the correct seam allowance). Welcome to our new blog! I'm so excited to have this space to post updates on Peach Patterns and hope that you will visit here often to catch up on our news..... (Photo shows Peach Patterns "Boho Tunic" made in a floral print rayon). On the new Peach Patterns blog I'll be sharing how-tos for your most popularly requested pattern hacks and modifications. Stay tuned to hear more about how this tunic length, double ruffle version of our "Leilani Dress" was created. Yipee! The Peach Patterns "Pearlie Dress & Peplum Top" sewing pattern will soon be in store. 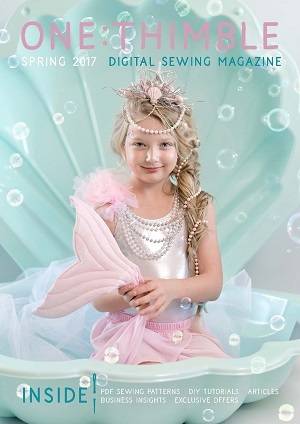 In the meantime, you can get your hands on this pattern over at One Thimble Digital Sewing Magazine where it is part of the jam-packed (Down Under) 2017 Spring Issue 16.